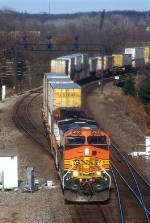 Description: A westbound trailer train comes around the curve at Hart, MO. Description: #4998 leads a westbound 8-unit light engine move at Blue Cut! Description: BNSF 4998 leads a UCEX empty into the siding at Old Monroe, Mo. where it will meet one. Description: Three BNSF C44-9W's hustle a pig train toward Chicago. Description: Switch cleaning takes a backseat to 4998 entering Cherokee Yard from the east. Description: Eastbound passing under Kellogg Blvd. Description: BNSF 4998 brings a snoot and standard cab NS dash 9 into Northtown Yard. Description: Double stacks and autoracks fly through on BNSF Train Q LACBIR1 21 in the whistle ban town of Seymour. Description: Descending Donner in a steady rain. Description: Two BNSF trains race westbound through Union Station. Description: Three GEs wait for twin sets of Geeps to finish building their train before departing Temple.